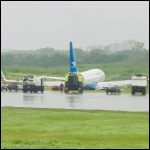 Xiamen Airlines flight 8667, suffered a runway excursion after landing on runway 24 at Manila-Ninoy Aquino International Airport, Philippines. There were no injuries according to the airline. At 23:08 hours local time the flight had descended to FL180 towards Manila. It entered a holding pattern to the north-east of the airport for about 14 minutes before positioning for an approach to runway 24. The approach was aborted at 23:40 and the aircraft position for another approach. The aircraft touched down at 23:55 but went off the runway. At the time of the accident a thunderstorm was passing the airport. Photos from the scene seem to indicate that the no.1 (left hand) engine had separated from the wing after the excursion. Distance from Xiamen Airport to Manila-Ninoy Aquino International Airport as the crow flies is 1149 km (718 miles).